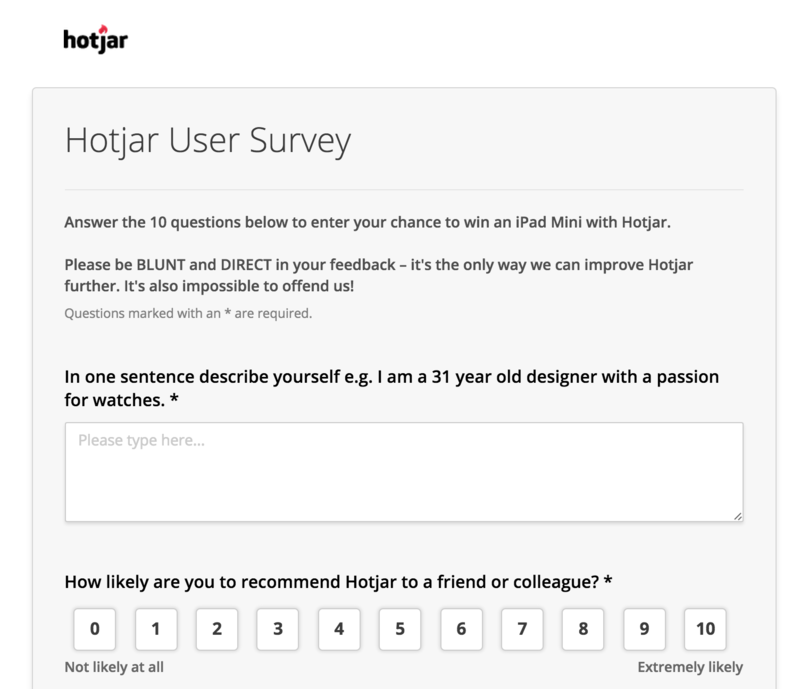 Hotjar's Surveys allow you to ask your site visitors or customers an unlimited number of questions. Additionally, you can invite people to fill in your survey directly from any page of your site and based on user behavior. If you would like to learn how to set up a Survey, visit our article How to Create your First Survey. Surveys are hosted on Hotjar's website. 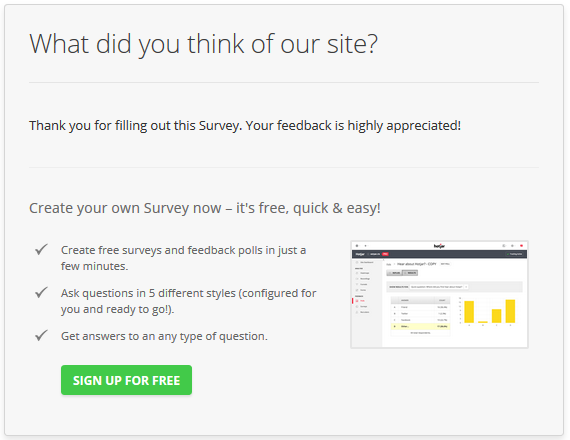 When creating a new Survey, you will be provided with a URL which you can give to users directly, such as including it in a newsletter email send out. You also have the option to invite user's from your site, which appears as a modal popup. When someone completes your survey, they are taken to a Thank You page. You can customize this message, including adding links to pages you would like to encourage users to go to next. 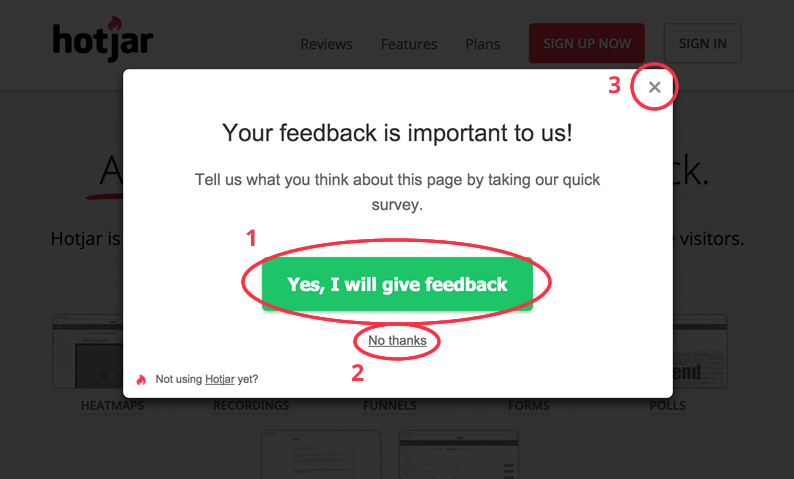 When inviting visitors to a Survey from within your site, visitors are shown a central pop-up asking them to participate. All the text within the popup is fully customizable, including the buttons. Take part in the Survey by clicking (1), opening a new tab to the survey page. Dismiss the modal and do not participate by clicking on (2) or (3) to close the popup. It is also optional for you to choose between the devices the Survey will show on as well as the percentage of your users it appears to. A cookie remembers which Survey Popups have been closed. When a visitor agrees to participate or not, Hotjar stores a cookie on their browser to remember this. This is done so that the same Survey does not show twice to the same visitor, even if they navigate to a different page where the same Survey is set to show. Learn more about the cookies we store. What languages are supported for Surveys? Most of the text in the survey and its questions are written by you, but we allow you to customize the Survey user interface to use over 35 different languages. You can read more here about the languages Hotjar supports. How do I remove the Hotjar branding? Only those on our Business plan are able to remove Hotjar branding from their Surveys. This can be done during Survey set up.